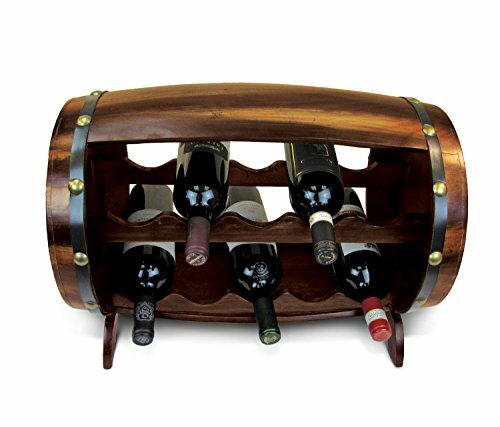 Our wood crafted barrel wine bottle holder is a beautiful and functional décor piece that will complement every home. It holds up to 10 bottles and will make a perfect gift. Barrels worth of both good times and good wine await when you bring this wine rack home! A high quality Fir wood barrel complete with metal banding and golden rivets has space for multiple bottles of your favorite vintage wine, thanks to the two-tiered shelves. The horizontal position of the bottles make it the ideal way to age wine by keeping the cork moist and unwanted air out preventing spoiling. Will make a great accent piece to any home in your bar area or bar cellar. The top of the barrel features a flat surface top to place wine glasses or additional bottles with raised edges to contain any spills. Makes the perfect gift to any wine enthusiasts or starters beginning their wine collection. Holds 8 standard sized wine bottles. Measures approximately 19.9"Lx11.8"Wx14"H. Wine bottles and contents not included. No assembly required. Wipe clean with cloth. This product is brought to you by Puzzled Inc. STYLISH WOODEN BROWN BARREL SHAPE WINE HOLDER - Efficiently maximize storage space with our brown Fir wood 10 bottle barrel wine rack. Unique home décor accent. MAKES THE PERFECT GIFT TO ANY WINE ENTHUSIASTS OR STARTERS BEGINNING THEIR WINE COLLECTION. Includes one 19.9"Lx11.8"Wx14"H wine rack with raised-edged flat surface top and multi-tier shelves. IDEAL WAY TO AGE WINE. Horizontal position of bottle keeps cork moist and air out to prevent spoiling. Barrel is hand made and hand painted with great detail. It is one of a kind! NO ASSEMBLY REQUIRED! Just pull out of the box. Made of real dark brown Fir wood & features top & bottom metal banding & golden rivets. 100% PRODUCT SATISFACTION GUARANTY FROM OUR COMPANY - No risk purchase, if you are not 100% happy with the purchase of our product send it back to us for full refund or replacement no questions asked. Guaranteed. USA customer service.